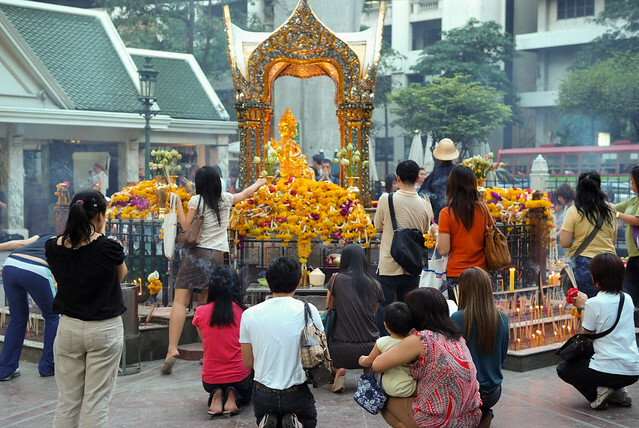 Erawan Shrine is a shrine in Bangkok of the four-faced Hindu Brahma God called Than Tao Mahaprom that attracts a number of visitors from across the world. Each of the faces symbolizes four directions east, west, north, south. Always teeming with worshippers, it is a photogenic spot where incense burn and traditional Thai dancers in full costume portray the Thai culture through their art. Many locals and foreigners come to pray at this holy object and seek blessings. It is said that in the first year of its construction, there were many mishaps as superstitious workers refused to work on it due to some superficial beliefs. Despite all the struggles, today there is a huge Erawan Hotel built in front of the shrine by the Thai government. The hotel is availed by the visitors because of its best service. A shrine is a nice place for a short visit and to experience grand hotels near the shrine.